Actual data in blue. The green line goes from December 1999 through December 2009, showing virtually no growth in a decade. But it’s always to calculate changes from a peak to a trough if you want to understand long term trends. 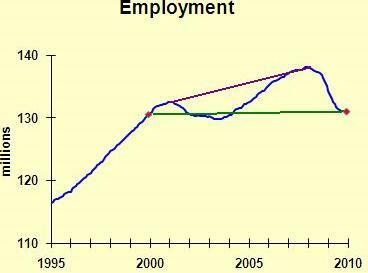 The economy’s ability to generate jobs over a long period of time is better examined by looking at peak-to-peak growth, which is the purple line. So, you can say that we ended the decade at the bottom of a business cycle, but everyone already knew that. Or you can say that the economy grows jobs over the long run, but not during the down stage of a business cycle. I think the latter statement is more useful.